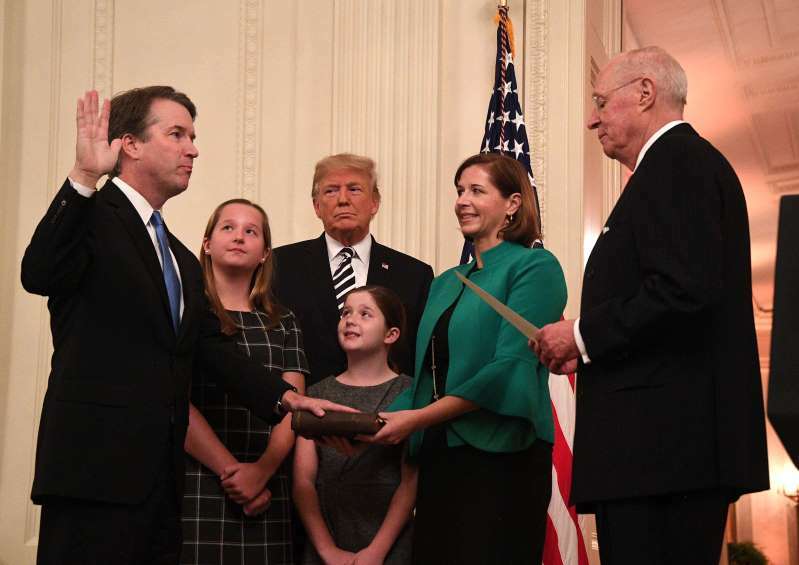 President Donald Trump, at the White House ceremonial swearing-in for Supreme Court Justice Brett Kavanaugh, offered an unusual apology to the judge and his family for his experience during the confirmation process. "You, sir, under historic scrutiny, were proven innocent," said Trump, as Kavanaugh and his wife daughters and parents looked on at the event broadcast live and attended by all the other Supreme Court justices, congressional leaders and administration officials. And Kavanaugh addressed concerns about his ability to serve in a nonpartisan capacity after his Senate testimony responding to allegations by accuser Christine Blasey Ford. In his testimony, Kavanaugh called the allegations a "calculated and orchestrated political hit" and "revenge on behalf of the Clintons." Historically, White House swearing-in ceremonies have taken place during the daytime and after the justice's work on the Supreme Court is well under way. President Donald Trump instead opted to hold the event before Kavanaugh's first official day on the bench and during an evening time slot, less than a month before the midterm elections. Trump's defiant comments are a far cry from the more restrained tone he took just two weeks ago, when he described Ford's testimony the Senate Judiciar Committee as "credible" and said she seemed like a very nice person. Since then, Trump has escalated attacks against Ford, including publicly mocking her at a campaign rally.